Local New Stampers & Stamp Enthusiasts! It's time to RSVP for January's "Last Thursdays" card class coming up this Thursday, January 26! I have all the details below, along with details on my favorite card from the class! Today, I'm sharing another card from that class featuring the most popular Sale-a-Bration selection...Hey, Chick! Watercolor Pencils Availability Announcement: Speaking of popular! Those new Stampin' Up! Watercolor Pencils are in such demand that they are now on backorder. Currently, you can still place an order for the pencils (#141709) and they will go into backorder, allowing you to get them shipped to you as soon as they become available again around February 13. Beginning Thursday, January 26 at noon (MT), they will not be orderable until after they have sufficient inventory in place. ►►Click Here To Order Watercolor Pencils Now so you can get them immediately when they are back in stock! January 26, 6:30pm. RSVP by Wednesday at 8pm. CASEd from Alison Solven at Stamp Crazy With Alison. It didn't take long for the Hey, Chick stamp set to become a favorite among the Sale-a-Bration selections. They certainly are some crazy, cute chickens! You can earn this stamp set for FREE when you place a $50 order during Sale-a-Bration! Chicken Wire Background—I stamped a 5-1/4" x 4" piece of Sahara Sand card stock using the Hexagons Texture Impressions Folder. That's right! Just ink up the "wire" side of the folder with Sahara Sand ink, then place the card stock inside the folder and burnish it with your hands. What a clever and perfect background for this funky chicken! Background Basics—I adhered the chicken wire layer onto a Basic Gray card base. Next, I added a 2" x 5-1/4" strip of patterned paper from the Urban Underground Specialty DSP. I also adhered a 2-3/4" x 2-3/4" piece of another Urban Underground pattern to a 3" square of Basic Gray. I dressed it up with some Cherry Cobbler Baker's Twine (retired from the Holiday Catalog) and adhered it to the card front. Funky Focal Point—I stamped the Hey, Chick chicken to Very Vanilla card stock with Archival Black Ink, then colored him in with an Aqua Painter and ink pads. I used Cherry Cobbler, Tangerine Tango, Sahara Sand and Smoky Slate colors. I die cut the colored image with the Stitched Shapes Framelits and layered it onto a Cherry Cobbler scallop circle made with the Layering Circles Framelits. It's popped up with Dimensionals. Sweet Sentiment—I love the "chicken scratch" style of the font in this stamp set! I stamped the greeting on a 1-3/4" x 1/2" strip of Very Vanilla, then fishtailed the ends with super-sharp Paper Snips. It's also popped with Dimensionals. Finishing Touches—It's fun to add that funky chicken image peeking in on the inside! Cute! Two Cool—The second card a horizontal card with the same elements. I used a different polka dot pattern from Urban Underground. Happy Hen—This cute image was colored in the same palette as the rooster above. Punny Saying—I LOVE the greeting for the inside of this card! LOL! 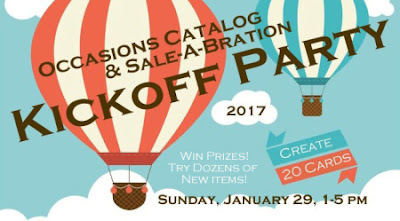 2017 Occasions Catalog & Sale-a-Bration Kickoff Party—January 29. Register by Jan. 22. Too Cool Team Meeting & Swap—January 9. RSVP by January 6. January Stamp-of-the-Month—Featuring Beautiful You. Register by Jan. 23. Details soon. "Last Thursdays" Monthly Card Class—January 26. Today we have another sneak peek from the upcoming Occasions Catalog & Sale-a-Bration Kickoff Party. This is the ULTIMATE new catalog event, because it allows you to play with dozens of new products from the catalog! You'll create 20 DIFFERENT cards, each one highlighting a different stamp set (or two) from either the Occasions Catalog or Sale-a-Bration Brochure! It's a fabulous way to try it before you buy it, while you stock up on cards for all occasions! This Class Is Filling Up Fast! Be sure to contact me today to get registered and save your spot. See Complete Kickoff Party Details! Guest Blogger! Michelle Hoover and I will be sharing a sneak peek of a Kickoff Party card every Saturday & Sunday over the next 3 weeks! Look for the "Kickoff Party Card" logo! Today, Michelle shares one of the cards she designed featuring the fun and quirky Hey, Chick stamp set, along with the awesome new Watercolor Pencils! The Hey, Chick stamp set in one of the FREE items from the Sale-a-bration catalog. 5th Annual Occasions & Sale-A-Bration Kickoff Party! Create 20 DIFFERENT CARDS featuring dozens of new products! Enjoy hourly prize drawings, exclusive specials and receive a FREE set of Watercolor Pencils in your kit! Contact Me By January 22 To Register! Don't you just love this funky chicken!? I've had a lot of fun playing with this stamp. One of the things I love about the Watercolor Pencils is that I can color my images any color I want and they coordinate with our other Stampin' Up! products! And how about that "chicken wire" background? I'll tell you how I did that a little later in this post! Focal point—I started by cutting the Whisper White squares and Basic Gray scallop squares using the Layering Squares Framelits dies. The chicken image was stamped at various angles using Archival Basic Gray ink. Next, I used the Daffodil Delight and Pumpkin Pie Watercolor Pencils and a Blender Pen to color the "hair" and tail feathers. I also colored the beak in Pumpkin Pie. These images are popped up using Stampin' Dimensionals. Background—To get the look of chicken wire in the background, I used the new Hexagons Dynamic Textured Impressions Embossing Folder. Only I didn't emboss it, I used it as a stamp! I inked up the raised side of the folder with Archival Basic Gray ink and placed my Whisper White card stock on it and simply applied pressure to get a "stamped" image. How cool is that? Too Cool! The new Hexagons Dynamic Textured Impressions Embossing Folder is like the Cable Knit one from the Holiday Catalog. It embosses a very deep, almost 3-D, impression in the card stock. Sentiment—The sentiment is stamped in Archival Basic Gray onto a 1/4" x 2-1/2" strip of Smoky Slate and fish-tailed at the end. The sentiment is also popped up with Stampin' Dimensionals. Finishing Touches—I added two pieces of the Urban Underground Designer Washi Tape at the bottom of the card. These coordinate perfectly with the color pallette I chose for this card. The card base is Basic Gray with a Delightful Dijon mat. Too Cool—I also made a second version of this card. I completely changed the color pallette on this one! This time I used the Daffodil Delight and Bermuda Bay Watercolor Pencils on the chicken. I added some Bermuda Bay Thick Baker's Twine tied in a bow. The sentiment was again stamped in Archival Basic Gray, but this time on Melon Mambo card stock. Thanks so much to Michelle Hoover for sharing this Kickoff Party card! I LOVE it and I can't wait to try that awesome chicken wire background! If you Sale-A-Brate with me, I'll spoil you with a by-invitation-only Sale-A-Bration Celebration on April 16! We'll have make & takes, gifts, prizes, specials, refreshments and more! Online To-Go Kits available! Qualify For Your FREE Invitation! Spend $150 total during Sale-A-Bration, host a $150 party or purchase a $99 Starter Kit! See Complete Sale-A-Bration Celebration Qualification Details! NEW 2017 Occasions Catalog Items Now Available! Earn A FREE Spot At My Sale-A-Bration Celebration Event—Place at least $150 in orders from Too Cool Stamping during Sale-A-Bration using the monthly SAB Hostess Code. January's Hostess Code is J47VBQN6. See complete details below. 3-Month Paper Pumpkin Pre-Paid Subscription—Only $55! Order Before January 10th For This Month's Kit! NEW 2017 Occasions Catalog Paper Sampler—Only $15! See Details! Contact Me To Participate By January 26! CLASS: Stamp-of-the-Month - Fall Fest Class—Sept. 11. Register by Sept. 4. CLASS: Countdown To Christmas Class—Next Class is October 4. Holiday Catalog—Your Holiday Projects Start Here! Join Me For Holiday Classes—We'll be creating Too Cool projects with Holiday Catalog products all season long at my upcoming classes! Some classes include stamp sets. Check out my Calendar of Events and make plans to join us! Just contact me! Host Your Own Holiday Class—Gather 6 or more of your friends and I'll bring a customized holiday class to you! You can help select projects, plus you earn Hostess Benefits! Contact me to schedule. There's only 2 Days Left to register for the Fall Fest Stamp-of-the-Month Class! Don't miss it! Contact me today to register! Have you ever wanted to try the Simply Pressed Clay? This is a great time to do it because the Simply Pressed Clay, Buttons & Blossoms Mold, and several Refill Inks are all on sale during this week's Weekly Deals! Check it out! CASEd from Margaret Raburn at Fun Stampin' With Margaret..
My team member Michelle Hooover brought this amazing card to our Team Swap last month. I love the color combination! The background features the fun Stamping With Embossing Folders technique that I shared with you last week. Background Basics—Michelle used 5" x 3-3/4" Watercolor Paper and Night of Navy, Real Red and Coastal Cabana inks for the background. She sponged the colors directly onto the folder, spritzed with water, then laid the paper onto the folder to transfer the pattern. Wow! That spritzed ink looks awesome with the Chevron pattern! The watercolor paper gives a more artistic, "watercolor" look, which I love! Once the design was dry, she wrapped some 1/8" Real Red Taffeta Ribbon around the layer, then adhered to a 5-1/4" x 4" piece of Night of Navy before mounting on the Real Red card base. Beautiful Bunch Bloom—The flower is from the Beautiful Bunch stamp set, stamped in Night of Navy ink onto Real Red card stock and punched with the coordinating Fun Flower punch. The flower center is another image in the set, stamped in Night of Navy ink onto Coastal Cabana card stock and punched with the 7/8" Scallop Circle Punch. Finishing Touches—Before popping the flower with Dimensionals, Michelle added some loops of Coastal Cabana Baker's Twine for eye-catching texture. She also colored a Rhinestone Jewel with a Cherry Cobbler Blendabilities Marker to add to the center. Sweet Sentiment—Last, but not least, Michelle added a Itty Bitty Banners birthday greeting stamped in Night of Navy onto Very Vanilla, then die-cut with the coordinating Bitty Banners Framelits. Have you tried the Stamping With Embossing Folders technique yet? It's so fun to experiment with it! Give it a try soon! 2 Days To Register! September Fall Fest Class! Join us at the September Stamp-of-the-Month Class where you'll create today's featured project, another autumn leaf card and 10 adorable goodie bags! Your kit includes the Fall Fest Photopolymer stamp set, goodie bags, In Color Designer Clothespins, and all the supplies you need to create the projects, plus envelopes and instructions. Just add ink and adhesive! Class-To-Go Kits and Demo-Only Kits (no stamps) are available. Pre-paid Registration Due By September 4, 2014. You are going to LOVE the technique we are trying at my "Last Thursdays" class on August 28. We're gonna "stamp" with an embossing folder...and it is definitely Too Cool! I know you'll want to join us! But first...it's Tuesday...which means there are new Weekly Deals available! This week, you can save on the Blossom Punch (which happens to be on today's project! ), Circles Framelits, two colors of Chevron Ribbon and more. Good thru Monday, September 1, 2014. Create 4 cards using simple, yet Too Cool technqiues, plus envelopes. RSVP to me by Wednesday, August 27. *Fine Print: Minimum $20 order for FREE local class; $50 minimum order for a FREE Class-To-Go Kit. Order may not be combined with other workshop, class, or other special events orders. US residents only. Bloom With Hope With Blendabilities—Try Blendabilities on this pretty Bloom With Hope card. Slanted Typeset Flower Patch—Learn tips on two-step stamping with photopolymer stamps and try the slanted DSP technique, too! Blended Papillon Butterflies—Blend two colors of Blendabilities to bring these butterflies to life! Mixed Bunch Stamped Texture—A Too Cool background technique using daubers, a spritzer and an embossing folder! This Is A Stamp Club Class Choice—If you're a member of my Too Cool Stamp Club, you can choose to take this class each month for FREE! See complete details! Want to join the club? I'm currently signing up stampers for Group #2. Do you ever discover a new stamping technique and it makes you so giddy that you jump up and down, clap your hands together really fast and squeal with joy? No? Just me then? Well, I'm sure you'll do the next best thing when you see today's fun technique—Stamping With Embossing Folders! This isn't about a raised embossed texture on the actual card. It's simply inking up the pattern on the embossing folder and stamping with it for an amazing watercolor background effect. And, you KNOW I love me a good background technique! Use Sponge Daubers to add Classic Ink colors directly to one side of an embossing folder. Use several colors that will blend well together and apply them randomly without overlapping. TIP: I like to use one Sponge Dauber for each color family and I wrap and tape a strip of card stock around the dauber so I know which colors are which. TIP: You'll get a different pattern depending on which side of the embossing folder you use. I used the "middles" of the Zig Zag pattern on this example, and I used the "outlines" of the same folder on my second card (shown at the bottom of this post). Spritz the inked folder with water several times until the ink starts beading. Lay your Whisper White card stock or, even better, Watercolor Paper, on top of the inked folder. Hold it in place and burnish over the entire piece gently with your fingers to transfer the ink to the paper. Lift the paper off, straight up, and let it dry thoroughly before adhering to your project. You'll need to clean your folder before you stamp another piece, so you don't contaminate your ink pads with the wrong colors. TIP: The fastest and easiest way I've found to clean folders is to simply rinse them under tap water and blot dry with a towel. As soon as I saw this fabulous card from Margaret Raburn, I knew I had to copy it! It's made with all of my most favoritest colors in one card! Woot! Background Basics—I started with a 4-7/8" x 3-5/8" Whisper White card stock, which I stamped with the inked Honeycomb Embossing Folder. After it was completely dry, I mounted it on a 5" x 3-3/4" layer of Island Indigo and adhered to an Olive Olive card base. Sweet Sentiment—I stamped the Lots of Thanks sentiment in Old Olive on a 3-1/2" x 3/4" strip of Whisper White, then fish-tailed the ends. It's adhered with SNAIL on top of the 5" x 1-1/4" piece of Island Indigo on the card front. Watercolored Honeycomb—I sponged on Island Indigo, Old Olive and Perfect Plum on the "middles" of the the Honeycome Embossing Folder. The wetter areas are more of a watercolor wash look, and the areas with less water have more of a stippled and distressed look. Both are pretty fantastic! Mixed Bunch Blossom—I stamped the Mixed Bunch flower in Perfect Plum onto Perfect Plum card stock two times. One image was punched with the Blossom Punch and the second image was punched with the 7/8" Scallop Punch to create a popped up flower center. Each petal of the flower is bent up, then curved under with a Bone Folder. Ribbon Leaves—I see these pretty loops of ribbon and twine under flowers all the time, but had never added it to any my projects...until this one! I looped the 1/8" Old Olive Taffeta Ribbon, adhering it to the back of the flower with Fast Fuse Adhesive. What a fun detail! My second version uses the opposite side of the Zig Zag Embossing Folder that was used in my "How-To" example. I really like the way this background turned out! So fun! Love those color blends! I only used a couple of loops for the ribbon on this version, and I changed the sentiment to a birthday greeting from the Peace, Love & Cupcakes stamp set. This one is my favorite...which do you like best? Want to try this technique at my "Last Thursdays" class? RSVP today!